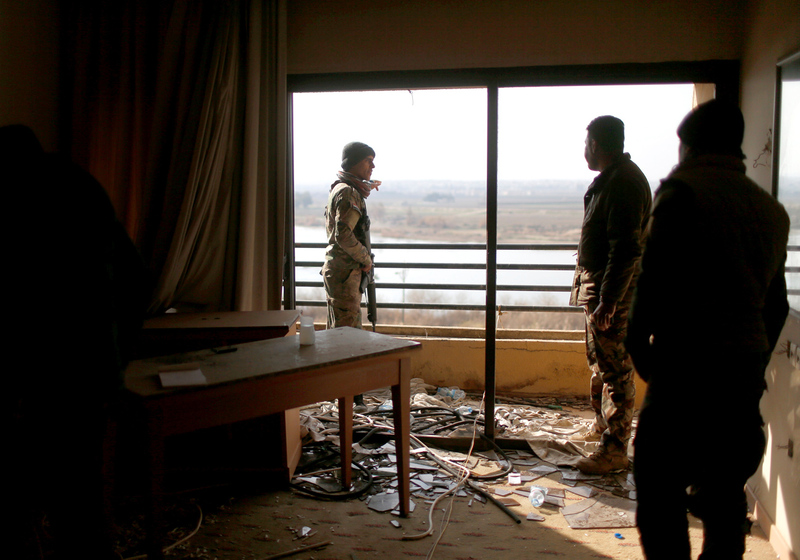 Iraqi soldiers look out from a damaged room in the five-star Ninewah Oberoi Hotel in Mosul city, Mosul, Iraq. Peshmerga, the Iraqi Kurdistan military units, have played an essential role in liberating Mosul from the Islamic State. Maj. Kawa Hussein, a Kurd battalion commander who came to Moscow for eye surgery, told Gazeta.ru about the brutal battle to free the city, where the jihadists are using child suicide bombers. Three months ago, Kurdish army Major Kawa Sayeed Hussein was on the front lines of the battle to liberate Mosul, where the Islamic State has its capital in Iraq. The battle to liberate this city of 1 million people began on Oct. 17, and since then the Iraqi army, aided by the U.S.-led coalition, has liberated the eastern part of Mosul. The coalition is now gearing up to attack the western part of the city. The initial operation was largely successful thanks to help from the Iraqi Kurds, who needed only a few days to clear areas in the north part of the city, thus paving the way for government troops. The 43-year old Hussein has served in the Kurdish militia since he was 18, and he now commands a 400-strong detachment. Is it true that the eastern part of Mosul has been completely liberated? Or are there still parts where fighting continues? Islamic State forces were ousted from the eastern area of the city several days ago. We made sure the area has been cleared, and then gave control to the Iraqi army because Erbil [the capital city of Iraqi Kurdistan] has an agreement with Baghdad. In the liberated areas we found the severed heads of our comrades. How long do you think it will take to liberate Mosul’s western sector? My guess: three to four months, because the districts held by the Islamic State will be difficult to liberate. The militants in Mosul maintain contact with Syria, and they cross borders at will, and can get all the reinforcements and resupply that they need. While the Peshmerga are prepared for battle, the Iraqi army isn’t, even though they have the most modern weapons and are well-equipped. The Peshmerga have about 150,000 troops, of which one-third, including Hussein's detachment, report to the Patriotic Union of Kurdistan. They defend the oil-producing region of Kirkuk. To outline our tactics, we never attack from the front. Instead, we encircle the enemy. The Islamic State's frontline troops are always suicide bombers, and it’s difficult to confront them and remain alive. So we encircle them and attack from the rear. Because of their weak defenses, and also thanks to the element of surprise, we quickly defeat them. What are the Islamic State's tactics? - Fighting against the Islamic State is a very bitter experience because they often send child suicide bombers against us, which is the only thing that stops us. They tie explosive devices to a kid and send him towards our troops. They also use women as living shields. Does the Islamic State take prisoners? A Peshmerga fighter caught by militants will have his head chopped off within 10 minutes. So they don’t take prisoners even for ransom? They are hungry for blood. The Islamic State doesn’t need our money. They are well-financed. The Islamic State has everything it needs, so it does not negotiate. Do the Peshmerga take prisoners, or is it a war of extermination? I personally took an Islamic State militant prisoner once. I first tied his hands and then gave him some water to drink to calm him down. We feed our prisoners, because they are first and foremost human beings, and we do not want other humans to suffer. But this is not their attitude towards us. Many Islamic State members have been surrendering recently, realizing that the Islamic State's days in Iraq are numbered. We opened a camp in Kirkuk for militants who surrender. How long does it take for a captured militant to be reformed? I can't be entirely sure; this is beyond my responsibilities. I do know though that the repentant militants kept are closely watched in the camp. As soon as we believe that a terrorist doesn’t plan to return to the Islamic State, he is returned to society. Islamic State members have recently surrendered even with their families. What will happen after Iraq is completely liberated from the Islamic State? We will make a stand for the independence of Iraqi Kurdistan. However, we will be unable to settle this matter on our own, and so, we look to Russia for help and support. Hussein says there are French and German schools in Iraqi Kurdistan but not a single Russian school. Neither he, nor his comrades who accompanied him to Moscow, with the exception of the interpreter, knew a word of Russian prior to arrival. They only knew Kurdish and Arabic.